Human beings in the year 2016 enjoy taking photographs of themselves, almost as much as they like complaining about other people doing it. But, what happens when selfie-snapping crosses the line from nuisance to dangerous? A new study from researchers at Carnegie Mellon University and the Idraprastha Institute of Information Technology in India looks into the direst possible outcome — selfie-related deaths. While individual stories of selfie deaths arenot new, this full collection of all the reported selfie deaths gives more insight into this depressing phenomenon on the whole. The researchers collected their data using credible news sources found via an extensive web searching mechanism, finding that 127 selfie deaths resulting from 85 incidents have occurred worldwide since March 2014. In some cases, like a boat capsizing in India, as many as seven people died at once while selfie-ing. 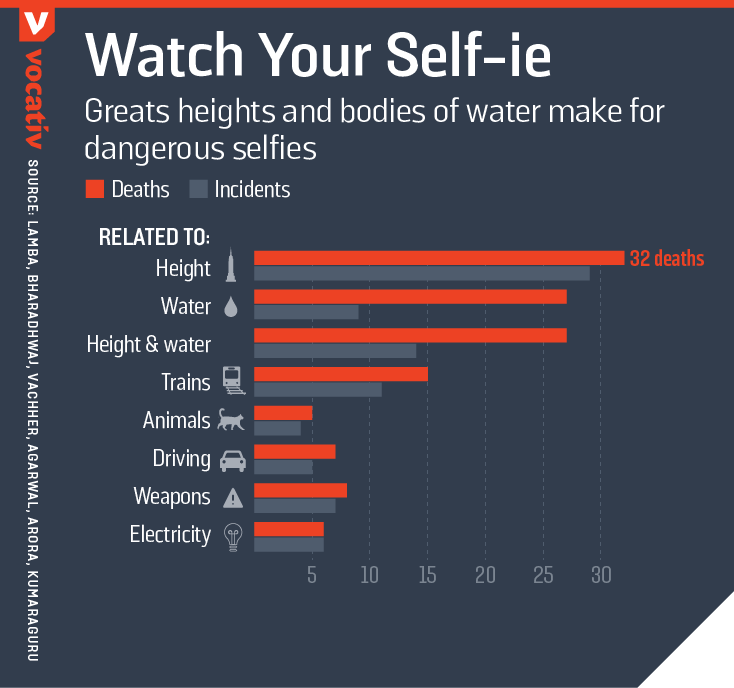 Height-related selfie deaths were the most common, closely followed by both water-related and a combination height/water-related incidents. The lesson to be learned here is quite obviously to avoid taking selfies on the edge of sea cliffs if you want to stay alive. 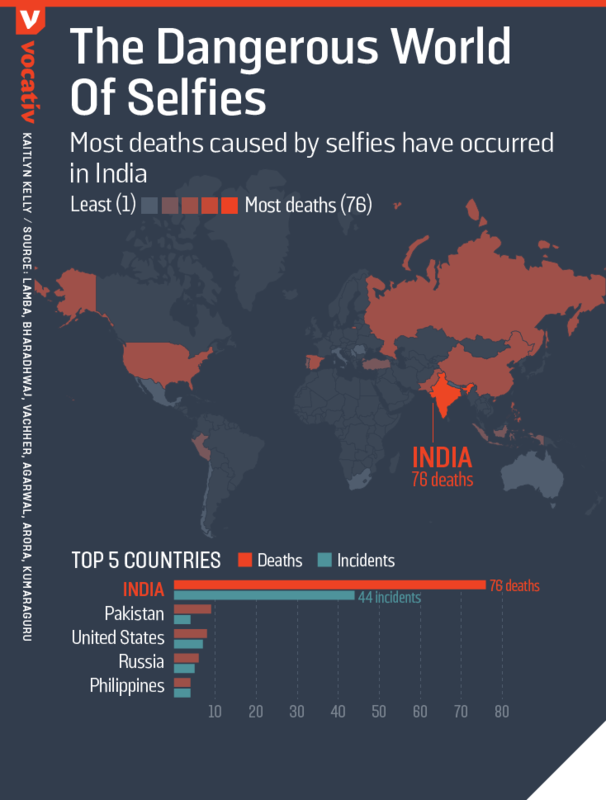 The vast majority of selfie deaths have occurred in India, with a body count of 76. In Mumbai, the reports of these occurrences led police to sanction 16 "selfie-free zones." "In the future we should figure out what it is about Indian culture, or Indian use of social media that is prompting such behavior," said one of the researchers, Henmak Lamba, a computer science PhD candidate at Carnegie Mellon University. 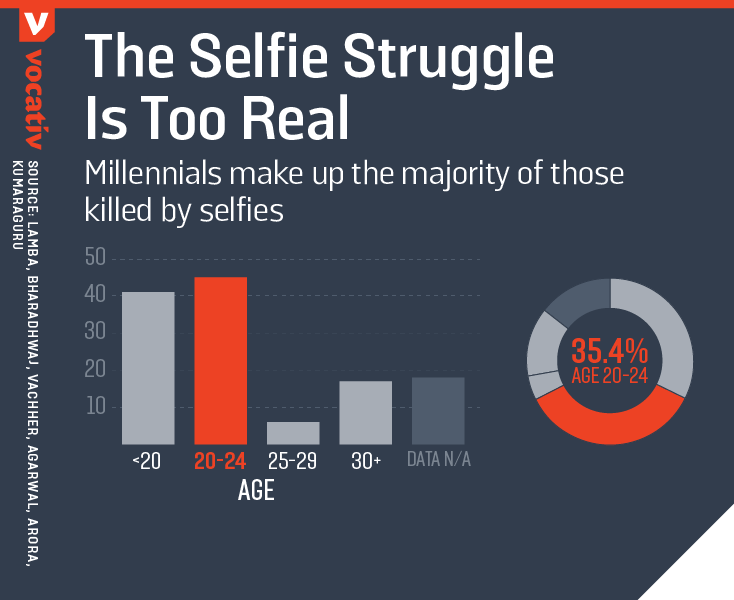 Unsurprisingly, the majority of those killed while taking a selfie were millennials. Almost 80 percent of those killed whose ages were included within the report were under the age of 25. Their machine-based evaluation method of identifying risky selfies proved to be somewhat accurate, with image-based features signaling a risky selfie roughly 70 percent of the time. While the researchers noted the potential of automatically identifying whether an image is dangerous or not for the purpose of discouraging unsafe selfies, they're hesitant about what to do with their findings. "We have to approach this problem really carefully, largely because we don't want...giving a [danger] score to each selfie...because teenagers taking a selfie using it to say, 'Look I took a selfie more dangerous than the one you took,'" Lamba explained. "So having a score-based system might not be an option." A reasonable concern, seeing as a large number of these deaths (while accidental) appear to have occurred when taking a wild selfie was part of the appeal, like in the case of the Mexican man who accidentally shot himself in the head while posing for a selfie with his .45-caliber pistol, or the Denver pilot who crashed his plane while pausing to say cheese. Be safe out there, guys. The post Death By Selfie: New Study Analyzes The Most Dangerous Pics appeared first on Vocativ.